When you’re designing a BI application to embed into your product, it’s important to design it for the many different people that will be using it. This maybe the savvy data scientist using detailed models predict churn or your stock controller who only needs to know what stock to replenish and where, and get on with their day job. Either audience the information needs to be consistent and engaging, while also being relevant to their specific needs. In this article I’m including some of the fundamental design principles that can help you design beautiful analytics for all of your customers. When it comes to design, keep it clear, crisp and as simple as possible. There will be different personas who use your analytics solution and they will all have different skill sets. By keeping your design as simple as possible you can make it easy for all of your users to understand the information presented to them. When designing dashboards, for example, people generally read left to right so have the most important things flowing that way. Keep the key metrics at the top and make them big. You always want to highlight what is most important. Also put any related visualizations or comparisons next to each other, as this gives the information context and helps users easily make correlations. Try and keep your dashboards to a single page. The more people have to scroll down any page, the less likely they are to consume information. By keeping the most important things on one screen or page, there’s a higher likelihood of the information being consumed and actioned. Keeping your analytics app consistent – from reports to the dashboard – makes it much easier for people to comprehend the information that is being presented to them. It creates a unified experience and also makes it easier for people to understand and absorb information. For example, keep your colors consistent all the way from your core application to your analytics product. This will give the application a seamless flow and make it easier on the eye. Color can be used to convey status, importance, type, region, value or any other important characteristic. From the classic – red is bad, green is good, to always associating certain metrics and dimension with the same colour across your application. For example, I might choose to code profit in blue. So every bar chart, line chart will always show blue when displaying profit. For your customers they instinctively know what they are looking at every time someone sees the color blue. Making it easier for your users to absorb information and recognize important things instantly across multiple data sets. Just remember that people who are color blind can’t distinguish between red and green so use other design elements as well – shapes, lines, degrees of shading – to help users recognize important information. Consistency becomes even more important as you create more content across the application. Things like naming conventions must be consistent across your application – don’t use similar names to represent different things. If three metrics each have different calculations, don’t call all of them “sales”. Your future report writers will be swearing at you every time they create their next sales report, or even worse – they use the wrong one and their reports are incorrrect! Giving each field a unique name makes it easier to identify. It’s also important to have a description behind each name so users understand what makes up each specific field. Another way to bring consistency to your dashboards is to use familiar chart formats. If it is recognizable it will be easier for users to identify with. There’s no need to add flashy design elements like 3D (never use this… ever) or specialized charts unless users are already familiar with them (and the data supports it). Often they just serve to confuse people and add unnecessary noise. 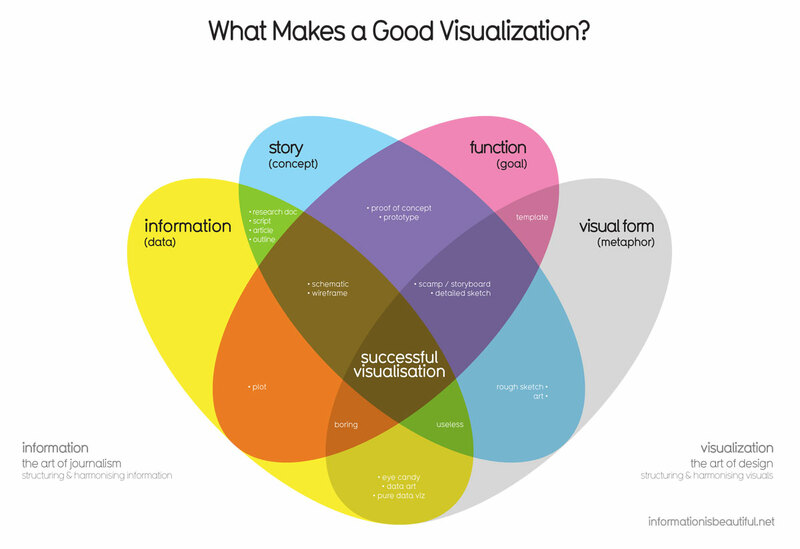 James Richardson of Gartner recently wrote a great paper called Four Ways to Get More Value out of Data Visualization that talks about how to use infographics to improve absorption, information retention, and make better decisions. One of the key takeaways from this paper is the importance of context. When you provide context to information it helps the audience understand, and therefore use your information. They will also trust the information more if they can see its contextual importance. Context is an often overlooked design item. While you might understand your data, your end users may not. This is why it is so important to give the user direction as to the story that your analytics are conveying. It might be as simple as using arrows or ticks and crosses, or it might include a full blown narrative about the information they are seeing. From annotations to comments, these are all design elements that give information context so users can more easily understand the information and the possible relationships. While it’s tempting to throw a lot of information into your dashboards and reports, it’s not necessarily the best thing to do. The aim is to help users easily see what information is available to them. Give them tools, like filters, to slice and dice their content, just don’t overwhelm them with too many filters – four or five is usually enough. If your users become confused because there is too much going on in a dashboard they may lose sight of what they’re actually trying to analyze. You may all the information in your application available, but it may not make sense to expose every persona to everything. When designing the product make sure that you only expose your audience to what they need, not everything in your kitbag. If you’re not sure what they need, then perhaps it may make sense to roll out features slowly. This way your users can get used to each one before you introduce them to new functionality. By slowly rolling functionality out you can also test the waters and monitor the uptake. There’s no point in having great information if no one is going to actually use it. When designing a product it’s important to look at how people will action the data and then build those actions into your product. This is a logical step in your product design, but it’s surprising how few businesses do it. Take a stock controller as an example. The analytics app might identify that stock has gone below a certain level, and the next logical step would be to top up the stock by a specific amount. So don’t just give the stock controller the information that stock has gone down, give them a solution that enables them to reorder stock. The more actions you can provide off the back of your analytics, the more value your customers receive. Investing time in design is money well spent. It ensures that your analytics application is as appealing as possible and helps the information resonate with your audience. There’s no need to overwhelm or bamboozle users with every possible alternative – they will get more value from your application if they can comprehend the information and use it to make better decisions.